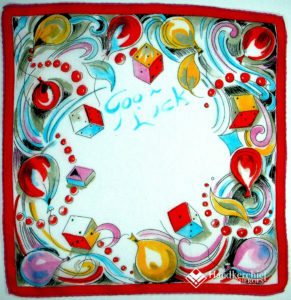 This sophisticated, celebratory hankie sends cheer and good wishes to the recipient in a multitude of languages. What a lovely gift to start off the New Year. 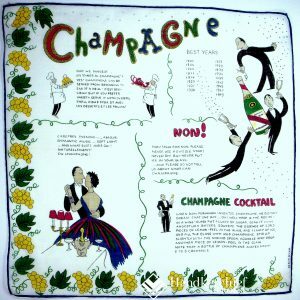 Sparkling and effervescent, champagne epitomizes jubilation and revelry. The list of “best years” ends at 1949, which helps us date this charming accessory. 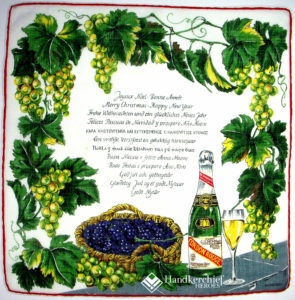 This hankie is a hoot. Although the dice spell “Good Luck” this gentleman’s roll may have sentenced him to buying a Mathusalem or (gasp) a Nabuchodonosor for the celebration. Yikes! One of today’s trends has folks spending New Year’s Eve in Las Vegas, Atlantic City or other casino hot spots, hoping for Lady Luck to kickstart their New Year with a winning streak. 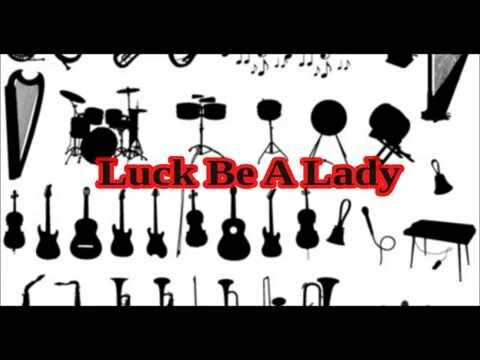 To enhance your viewing, an instrumental of Luck Be a Lady by the Lame Street Band. The song was written by Frank Loesser in 1950 and featured in the musical Guys and Dolls. 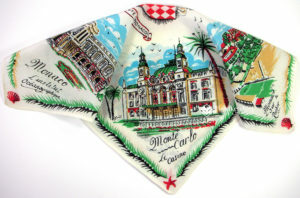 A silk souvenir from the French Riviera surely holds memories of starlit nights and games of baccarat chemin de fer beneath crystal chandeliers. This gem includes the likeness of HRH Princess Grace on a postage stamp. 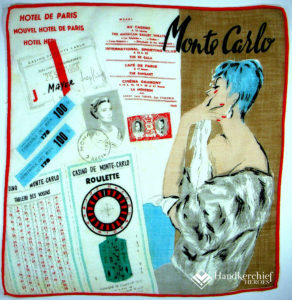 Note our mink-stoled maven sports a lace trimmed evening handkerchief. Regardless of resolutions and good intentions, every New Year starts with a roll of the dice, so flaunt your come –what-may attitude with these flirty fashions. Green and gold dice tumble and twirl on this rosy fantasy. Yes, that’s gold paint shimmering throughout. 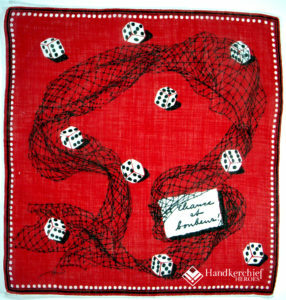 This hankie was strictly for fashion, not function. It’s fanciful, fabulous and fun! These geometric gems are sooo 1930’s. The dice seem to crown the apex of skyscrapers in a cityscape. Perfect for either a lady or gentleman. Dice float like wind tossed marshmallows betwixt and between celebratory balloons. If you’re not a whiz with games, perhaps your skill lies with trivia. If you hear the words “Liberty Bell” what comes to mind? Could there be more than one answer? Indeed. Charles Fey of San Francisco is commonly credited with inventing the “Liberty Bell” in the late 1800’s. His Liberty Bell was the first what? (Answer at the end of the blog.) Now, back to the games…. 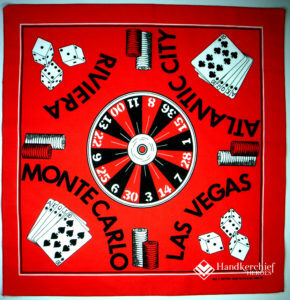 One timeless casino favorite is roulette. Below, little knights wield croupier’s sticks to swoop up stacks of poker chips. 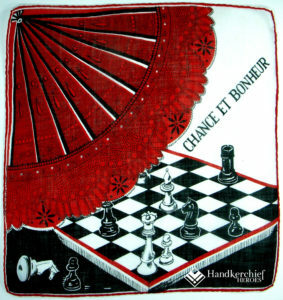 Note the French “Chance et Bonheur” which translates Luck and Happiness, a message found on many a fashion handkerchief. What would a casino be without poker? 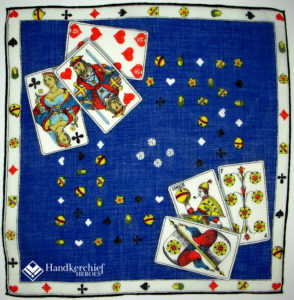 Here’s a royal flush – in diamonds no less, which indeed, the lucky player may indulge in purchasing, once he’s cashed in his chips. Countries around the world partake in card games, from childhood upward. 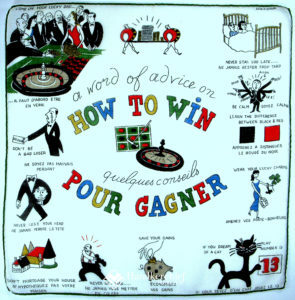 Many expressions used in cards are transferable to the game of life. 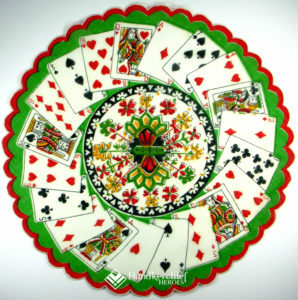 Someone holding a Royal Flush is considered to be “holding all the cards”, thus, the grand winner over all. 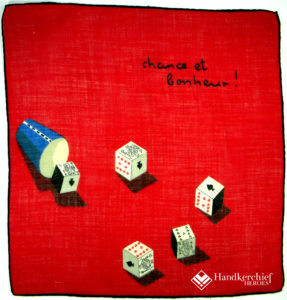 The opposite is being “dealt a bad hand”, with dismal odds for success. When you don’t want others to see your cards you are said to “play your cards close to the chest” as opposed to “laying all your cards on the table”. People are cautioned to “play your cards right” if you want to succeed in an endeavor, and in some instances, you may even have a chance to “play your trump card.” The trump card holds a higher value. 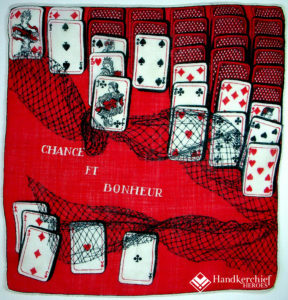 If you have a good card but are keeping it hidden, waiting for just the right moment to play it, you are said to “have an ace up your sleeve.” You can readily see these plays relate to life as well, whether you decide to lay your cards on the table or sequester that little ace up your sleeve. 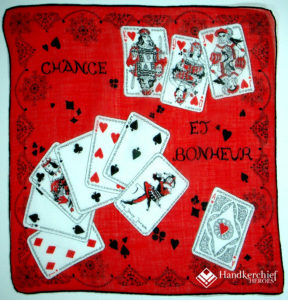 Here’s a fun, flirty hankie to let peep from your pocket or drape over your belt as you wend your way through the casino. 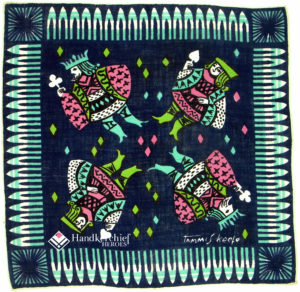 A fanciful frolic of Kings, Queens, and knaves in soft spring hues. 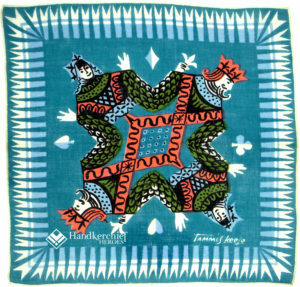 No one can top textile designer Tammis Keefe when it comes to composition and color. Keep one of these merry mouchoirs in your pocket and you may be inspired to play long into the wee hours. 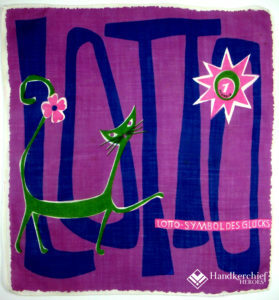 This prolific artist passed away in 1960, so we know these images are prior to that date. Back then olive with salmon and turquoise was cutting edge. The image is perfection. 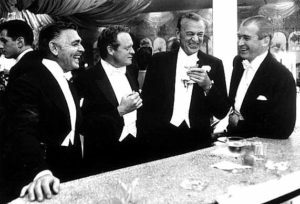 They’re not the four Kings of Hollywood, but nevertheless, still a handsome quartet in royal regalia. 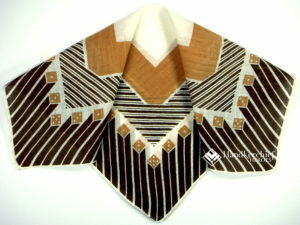 Royalty in Renaissance attire adorn this beauty. 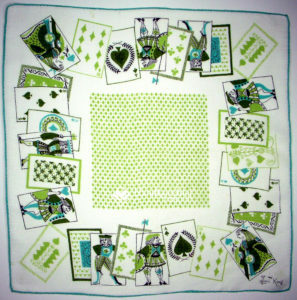 Note the teensy dice dead center, surrounded by not only the four suits of spades, hearts, diamond and clubs, but also orbs, acorns, roses, bells, shields and more. 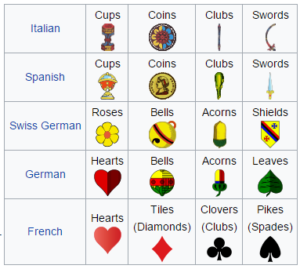 Many of these images are featured in the table below* which illustrates how different countries suited their cards. Histories vary as to the origin of playing cards. 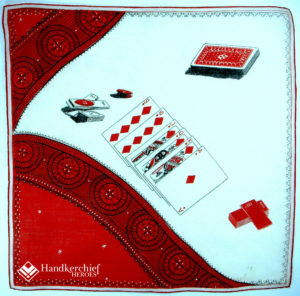 Some claim card playing began as a gambling game in the 10th century in China or India. Cards possibly entered Southern Europe in the 14th century through Egypt, where the suits were cups, coins, swords and polo sticks. 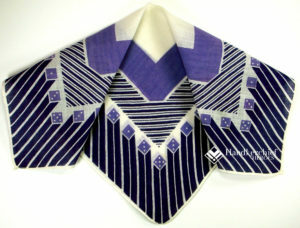 As cards became more popular, various cultures created their own suits. 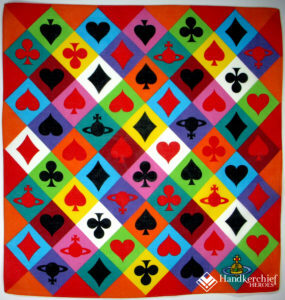 In France, card makers chose spades, hearts, diamonds and clubs. Purportedly, the suits represented the four classes – Spades represented nobility, Hearts embodied the clergy, Diamonds personified merchants and Clubs typified the peasant class. The history of playing cards is voluminous and fascinating, with dozens of books explaining the symbols and their origins. 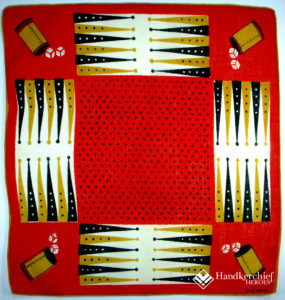 We can’t do them justice here, but it’s no surprise they are a popular subject for fashion handkerchiefs. 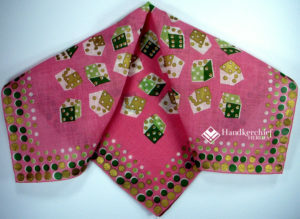 It’s also no surprise to find playing cards on these fashionable lipstick hankies. For one thing, no lady wants to excuse herself from the table when she’s on a winning streak. She can reapply and blot her lipstick right there at the game. 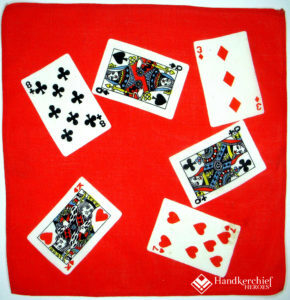 In addition, waving a little red flag could prove to be a calculated distraction at a crucial moment, such as during a bluff in a poker game. 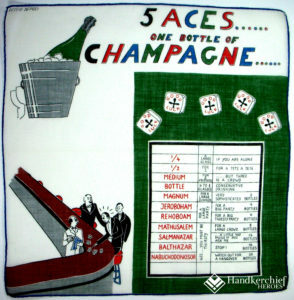 These “roll of the dice hankies” are ab fab, n’est-ce pas? Note the dice on the left sport images of playing cards, creating a hybrid of dice & cards. Ah that a hand could actually hold four ace of spades! From the top hat and wands featured in the hankie below, we can assume prestidigitation is afoot, and what magician leaves home without his trusty deck of cards? 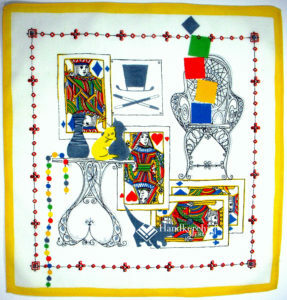 With magic on the marquee, methinks this is a perfect handkerchief to carry in Las Vegas. Regardless of what the cards hold in store for you in the coming year, we wish you many colorful adventures; hopefully some may include hearts and diamonds, along with boundless good luck in spades. Songs about gambling are almost too numerous to List. Viva Las Vegas alone has been sung by everyone from Elvis to Engelbert Humperdinck, ZZ Top to Nina Hagen, to Bruce Springsteen and more. This compilation, courtesy of Anthony Curtis’ Las Vegas Advisor, lists songs and recording artists (not necessarily the lyricist or author of the song). One wonders if these were written after a big win or a big loss. Probably a bit of both. I Got Mine – Jim Kewskin, Dan Hicks, et al. *Image table courtesy of Wikipedia. Wow. I love the gambling and luck visuals and information as I am in Las Vegas reading it. You put so much work and love into each issue. I do it for readers like you who appreciate it! 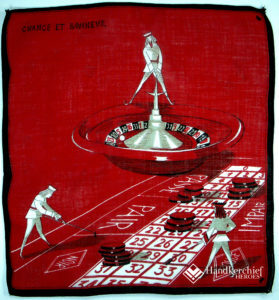 Amazing the artistic attention to a subject like cards, gambling, games, etc! Well Done! 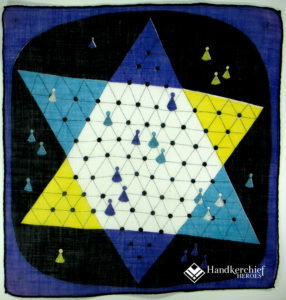 As we saw with our blog on dreidels, which were adapted from an ancient form of gambling, games of chance and gambling have been around since time immemorial, and are referenced in Egyptian, Greek, Roman, and Chinese history, with dice dating back 40,000 years. It seems to be an ingrained fascination without borders.